Like so many of you out there, I couldn't help myself when 23andMe dropped the price for their test to $99 last December. I took full advantage and ordered a test for my husband as well as one for myself. Well, my results came back late last week and I found them reaffirming and interesting all at the same time. In a prior post, My MtDNA Result Are Back!, I revealed the results of my first MtDNA test. 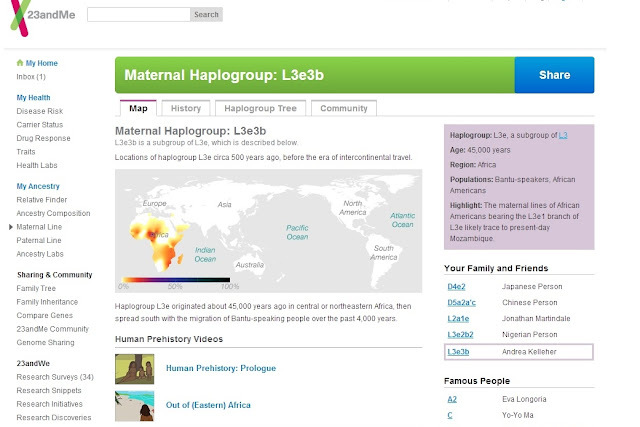 I tested with FamilyTreeDNA last year and they determined that my Haplogroup was L3e3b. It was reassuring to see that 23andMe came up with the same result this time around. I think I can now safely claim L3e3b as my Haplogroup. 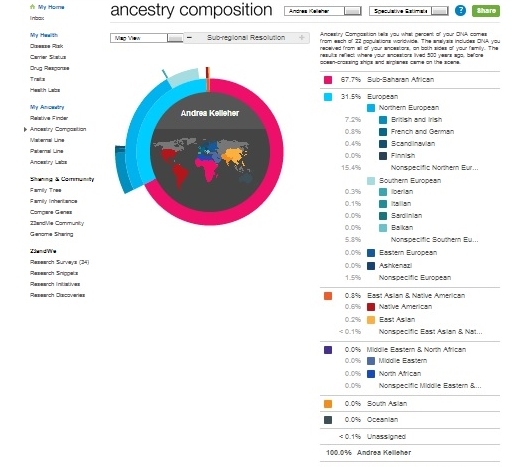 Okay, now we're going to get into the meat of the situation ---my ancestral breakdown. 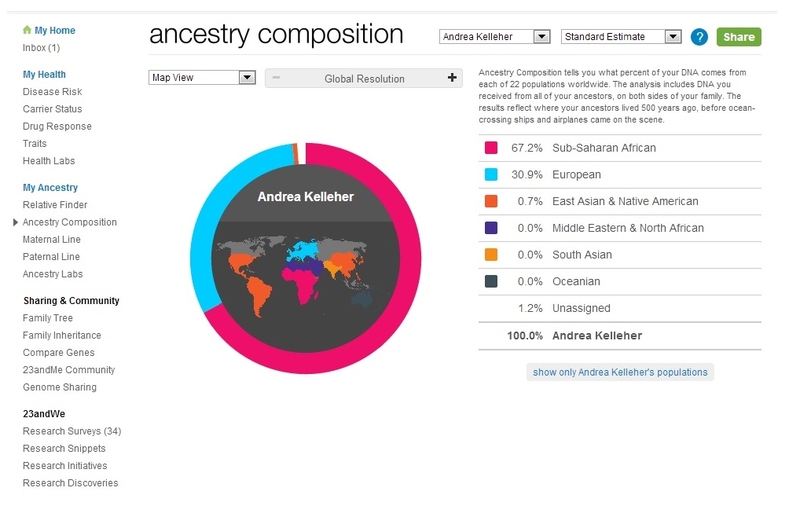 I have taken three other Autosomal DNA tests, first with African Ancestry, next with Ancestry.com and then lastly with FamilyTreeDNA. Not one of those tests was able to detect any Native American Ancestry. Would this test find anything different? 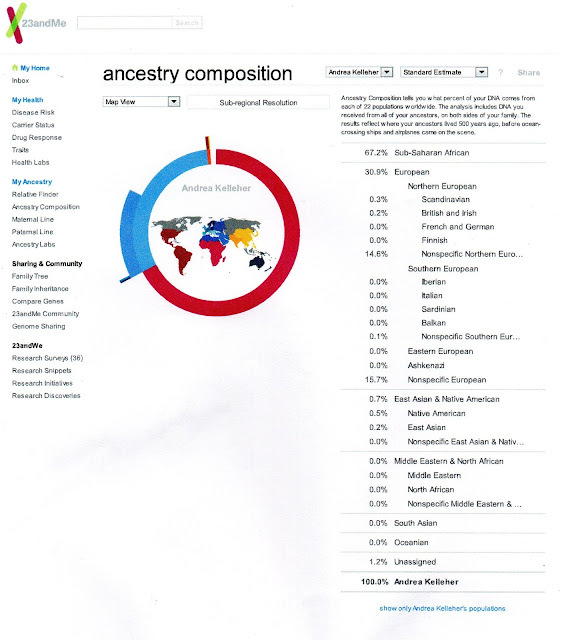 23andMe has the ability to break down the results a bit further which is interesting to see as well. Now these breakdowns were based on their standard estimate. 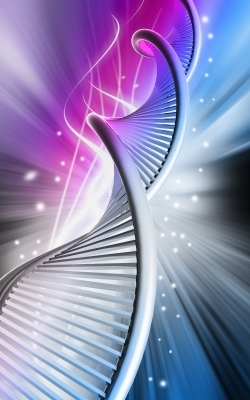 23andMe does give you the option of viewing your results under a more conservative or a more speculative estimate. No I couldn't let the whole Native American thing go folks. Something inside me said keep stirring the pot to see what turns up. Lo and behold there it is. Now, not a lot mind you but it's there. Of course now this gets my curiosity going in regards to my mom. It's her side of the family that is supposed to have the Native American ancestry and so I am assuming that is where it comes from in me. I wonder what her ancestral percentages would be. Wouldn't that be something if we found out the Native American was from my father's side of the family. I guess I will be purchasing some more tests. Ha! Great Presentation! and breaking down all the estimates. They are so visual. Mine have come out the same for Native American. I'm glad all testing came with the same Haplogroup! 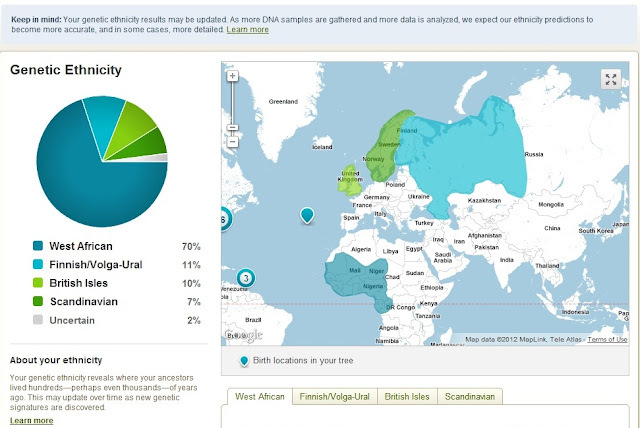 I have yet to test with FTDNA but now soon, they will be able to take my Ancestry.com raw data! I didn't know about the breaking up into smaller bits. Of course I had to go do it on mine. They say all of my .4% South Asian/Native American is South Asian. How weird. I know I said this last time you gave your results but I'm also L3e3b. Hi Kristin! I am glad my post was able to help. Yes, I remember you are my L3e3b sister. I haven't come across anyone else that I know yet who shares this Haplogroup. Have you? Thanks for reaching out. 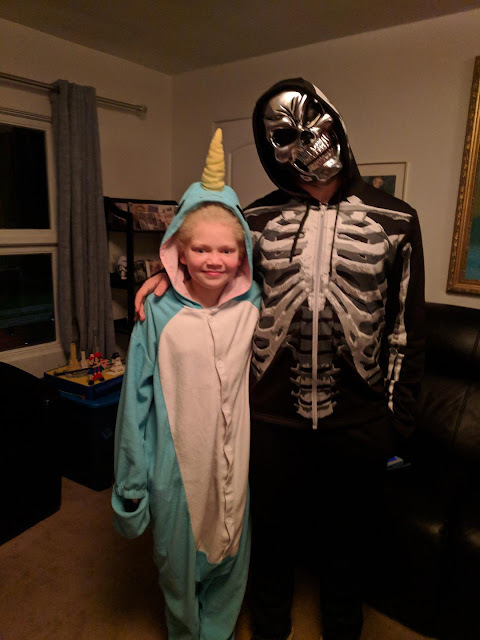 Good to find another person of L3e3b origin. Good to know another person with L3e3b. Thank you for your comment. I really like the 23andme breakdown. Now that I am getting into my birth family ancestry, the mapping and the documents available to me all make sense and it aligns with the results. That is great that everything is lining up with your results. I am so interested in all that you are finding out in regards to your birth family. 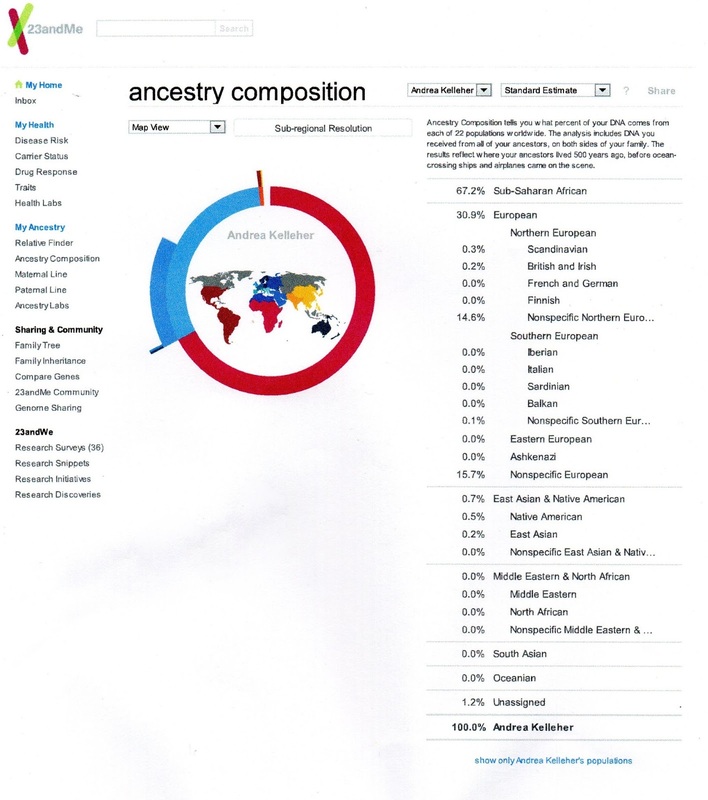 I like the 23andme breakdown too. I promise once I begin to introduce my Great Grandparents, and their locations, I will put the info together with my 23andme results. I like how you presented yours. You always do such a great job. Do you recommend 23andme over the other tests available? I'm an afrobrazilian keen to find out more but I'm unsure where to start - costs are high on the paternal and maternal at African ancestry, I was about to order it when I came across your blog and did some research on the $99 that seems to fit my budget better but will be pointless if the results aren't detailed when it comes to my heritage that's currently unknown. For the money, 23 and me, to me seems to be the best value. 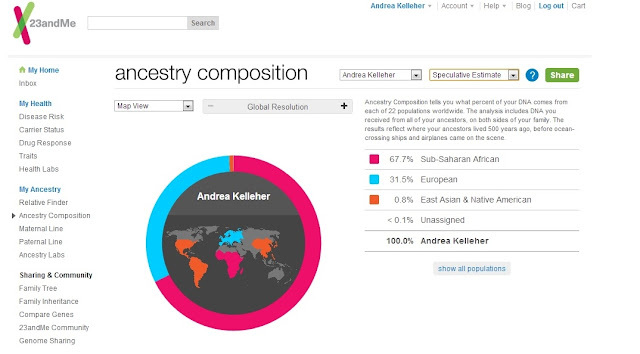 With one test it provides an autosomal test (ancestry composition) as well as haplogroup information. In addition, there is all the health information, they provide you with. The are not able to give you a specific country of origin for African Ancestry. They will just tell you a percentage. They are able to break down European ancestry a bit further. If you are looking for a more specific ancestral breakdown and you have African Ancestry, you would need to look into testing with possibly African Ancestry or FamilyTreeDNA. Hope that helps. Thanks Andrea, it does help specially coming from someone who has African ancestry like me and did both tests. Even with the current discount of $50 the other test seems quite expensive for one small percentage of data result. With our slave history in brazil I'm sure there will be a big percentage of European in my result but I don't know if any test nowadays can pinpoint the exact region I could possibly come from, these seem like expensive estimations only. Like I said on the myDNAmix thing,the very tiny single digit Native American/East Asian percentage most likely is noise. These companies,even though they use hundreds of thousands of SNP markers,don't have an adequate enough reference population sampling for African Americans. Either it could be the blend of different African ethnic groups and no adequate enough reference populations for west African,even though they're all west African,with the hundreds of thousands of SNPs,or it could be the mix of black and white with the hundreds of thousands of SNPs,or it could be both the blend of ethnic groups with the interracial with white with the hundreds of thousands of SNPs. Now,even though FamilyTreedna is not the same as 23andme,Familytreedna has said about their Population Finder test,which uses about if not the same number of SNPs as 23andme, that there is infact a noise threshold of about 3%. Anything less than 3%,they consider that as possibly noise. 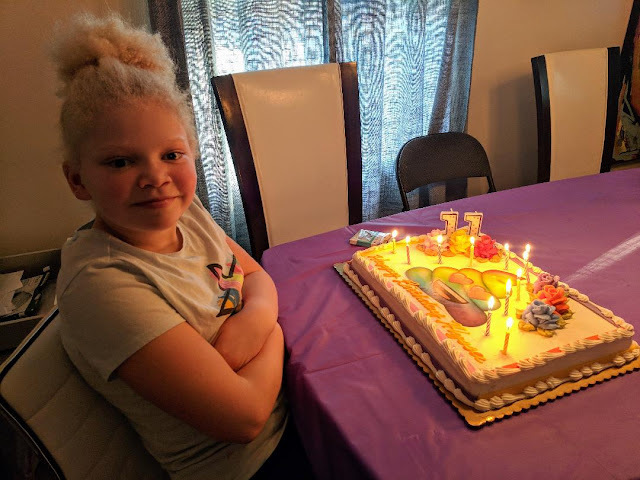 I'm pretty sure that if you got someone like your daughter, who has a black parent and white parent,tested with 23andme,they would most likely also be assigned an estimated "0.5 to 1.8% Native American/East Asian" result when they really don't have absolutely a single trace of Native American ancestry absolutely in their family tree anywhere. I'm also sure that someone from a place like Cape Verde,where people have mixed black and white ancestry with no history of any other race of people being around,were to test with 23andme,they very likely would also get the same result. I think the best thing to do is to have the parent with the suspected ancestry tested and if they plot the same with those segments it is probably real. Even if less than one percent. If you share the same segment(s) as your parents is a good sign those regions are what they say they are regardless of what ancestry it is. If you are the same person*Reggie* that I think, you are you been slamming African Americans on Facebook and Yahoo regarding this entire topic. Saying their percentages are fake. You almost sound disgruntled because you are not showing the ancestry that they are showing. That is Native American. Sorry to any African American folks who get these less than "2% Native American/East Asian" results who got their hopes up! But these companies need to be more clear on how the estimated percentages should be interpreted. Mayby in the future when companies like 23andme get more adequate population sampling for African Americans,these false 1% results should be gone. If you do get your mom tested,very highly likely she'll get the exact same result or very very close to it,that'll tell you that it's most likely statistical noise. I appreciate your comments Anthony. I will keep in mind that this may be statistical noise. I know what they are finding out through DNA testing is constantly changing. My heart and mind are open either way the results may go. There is something to be said about oral history in families. Some of it may not be accurate but often there are nuggets of truth that can be determined from the information passed down. I guess we will all have to wait and see how the science unfolds. Andrea, This is really helpful. I have used Ancestry.com and FtDNA. First, I am a black American adopted with no knowledge of biological ancestors. So such tests are of utmost interest to me. After my FtDNA test turned out to only be maternal because I was new and ordered the wrong one, I tried Ancestry. That one came back in about a week with a huge general estimate and an almost just as huge "uncertainty." It felt sloppy and false. So I returned to FtDNA for an ethnicity test. Like the first time, after weeks of waiting, they told me that they messed up and had to re-request another sample. Second time. I am still waiting for that test. But I do like their percentage breakdowns. However, your results on 23andMe are so comprehensive. They seem to really have an interest in making results easy to understand, which the others I have tried do not. FtDNA's results are like a chart of data. I've spent hours online trying to figure out what your results detail upfront like the Halogroup meaning. Although at this point I have spent far too much on tests, I am going to try 23AndMe because of you...and their cool TV ad. I am glad you found my post helpful! Good luck to you with your DNA findings. I'm L3e3b also through 23andMe. I just got my results a few weeks ago. Same here....I'm also late but am L3e3b. I'm late also and my maternal haplogroup is L3e3b as well. I want to also know more about it and where it came from.